WAIST HIGH: Happy 25th Birthday Murmur. 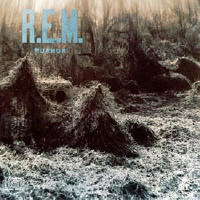 The debut album by R.E.M., Murmur was "one of the first 'alternative' rock albums to gain attention in the mainstream press," and drew critical acclaim "upon its release for its sound, defined by singer Michael Stipe's cryptic lyrics and guitarist Peter Buck's jangly guitar style." Murmur's sound "characterized the quieter, introverted side of the first wave of alternative rock in the United States. The sound was new at the time, though not stepping beyond the constructs of traditional rock music. The guitars have a bright ring like chimes that brought on comparisons to The Byrds, and the bass guitar has the bright punchy sound of the Rickenbacker favored by Mike Mills. Mills carries much of the melodic element of the music on the bass, contributing to the moody sound of early R.E.M. albums. Also contributing to this sound is the distant singing of Michael Stipe whose obscure lyrics, sung indistinctly, lend to the mystery and depth of the music." Murmur went to #36 on the Billboard album chart, and a re-recorded version of the great "Radio Free Europe," Murmur's lead single, reached #78 on the singles chart. Murmur was Rolling Stone's Best Album of 1983.